This past week, we have started implementing some of the Orton-Gillingham approach into our center time. The activities that are presented are unique to each child’s ability level and their familiarity with letters, phonemes or letter sounds, or their ability to blend sounds to make words. We start with a visual component that helps students practice recognizing the letters and what sounds they make. 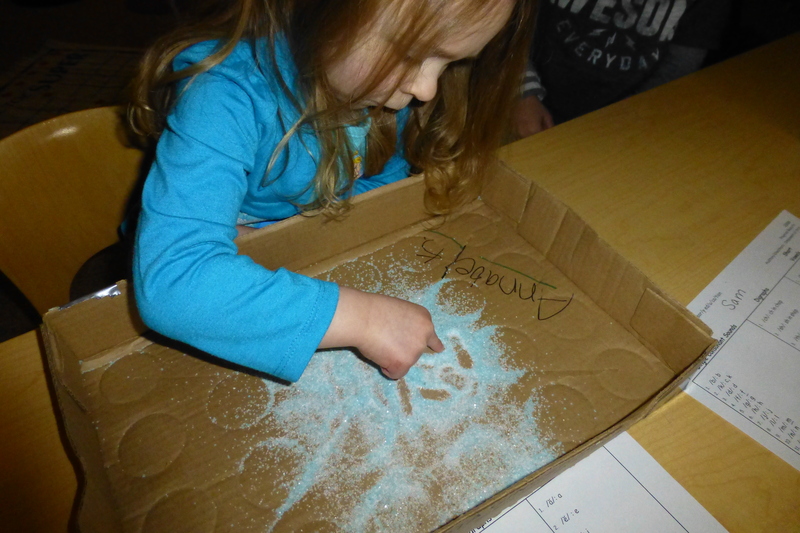 Then, we move on to a kinesthetic activity where students form letters in a mixture of fine and course, colored sand. The students are given a letter sound and they must then verbalize the name of the letter that makes that sound. Then they finish by writing that letter in the sand. The sand provides the students with a multi-sensory experience where they can see, feel, and hear the sound of the letter as it is formed. Students who have already mastered the basic sounds of each letter, move on to learning about sounds such as /th/, /ch/, and /sh/ and when they might be used. Learning these three sounds opens up a whole new world when it comes to writing the sounds that they hear in our language. We also work on blending simple to complex words using our blending board. The words that we are blending are often times nonsense words. We chose to make nonsense words because it forces the children to slow down and sound out each letter rather than just reading the word as a whole. This helps those students who tend to look quickly at words, usually only seeing a few letters, and assume it is a similar-looking word. For example, a child may see the word “boy” but read the word as “baby” instead. Another Orton-Gillingham technique that we use with a few of the students is arm-tapping. This technique gives students a strategy for spelling non-phonetic words such as “the”, “they”, or “was”. The students practice tapping up or down their arm (depending on whether they are right or left handed) as they say the letters that spell the word. The more they practice this skill, while saying the letters out-loud, the more pathways that are created in their brains, making the information more meaningful. We will continue to modify the activities for each student as they become more comfortable with techniques and the information they are learning.